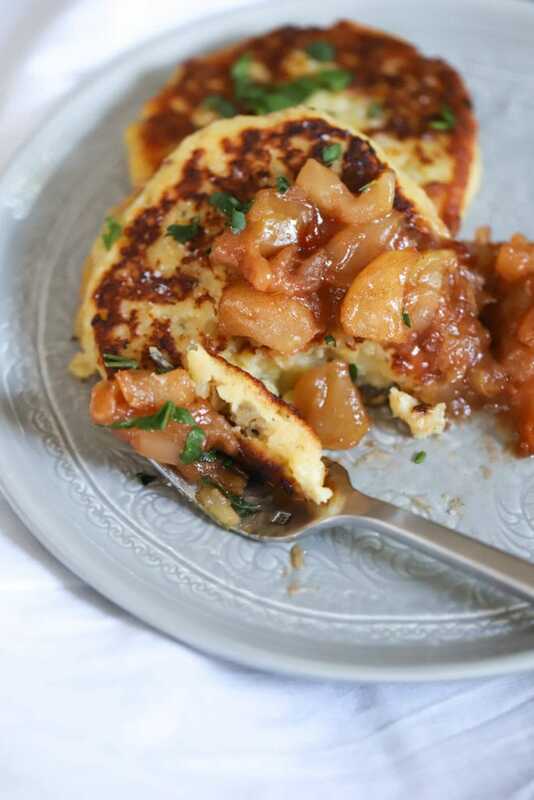 To make these, I start the apples so they can soften and get syrupy while I work on the potato cakes. 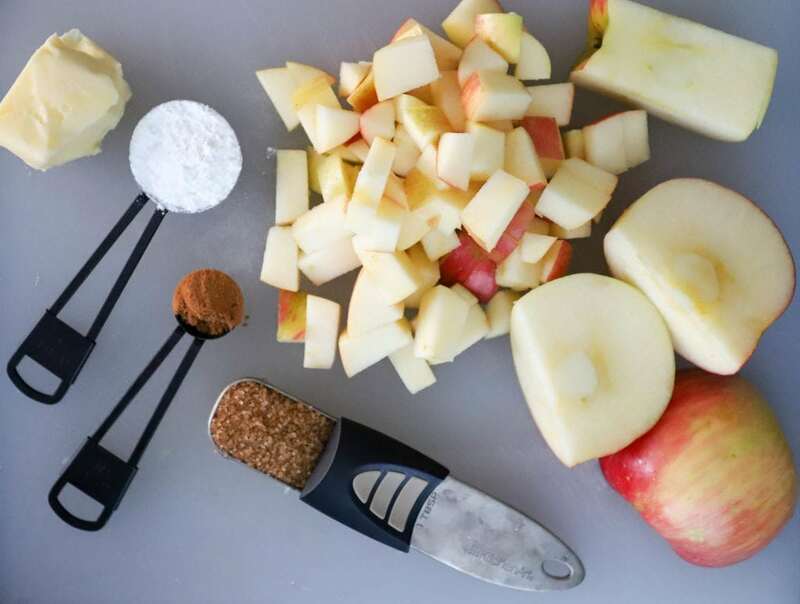 Dice some apples (skin on, please, for texture and no waste and to save time) and gather sugar, cinnamon, cornstarch, some butter, and a little bit of water. Place the apples in a skillet with the butter over medium-high heat. Whisk the water and the cornstarch together until it’s smooth, then pour the mixture into the skillet with the sugar and cinnamon. Stir the mixture together and let the apples simmer for about 30 minutes until the apples are soft and the syrup is thick. Add more water about 1/4 cup at a time during the cooking process if needed to avoid the skillet drying out. 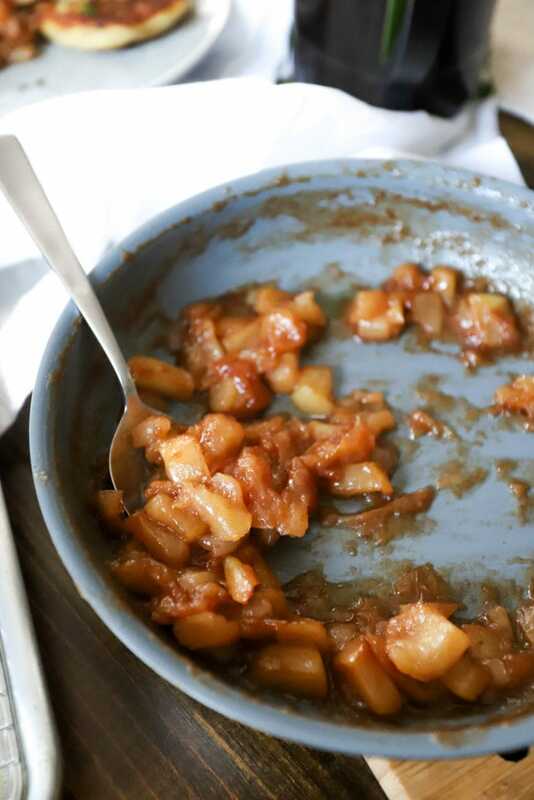 If the apples get soft and syrupy before you finish the potatoes, just remove the skillet from the heat and let them hang out while you get the rest of your meal ready. They’ll look like this. For the potato cakes, combine an egg, some flour, onion powder, garlic powder, salt, and pepper in a bowl with cold leftover mashed potatoes. 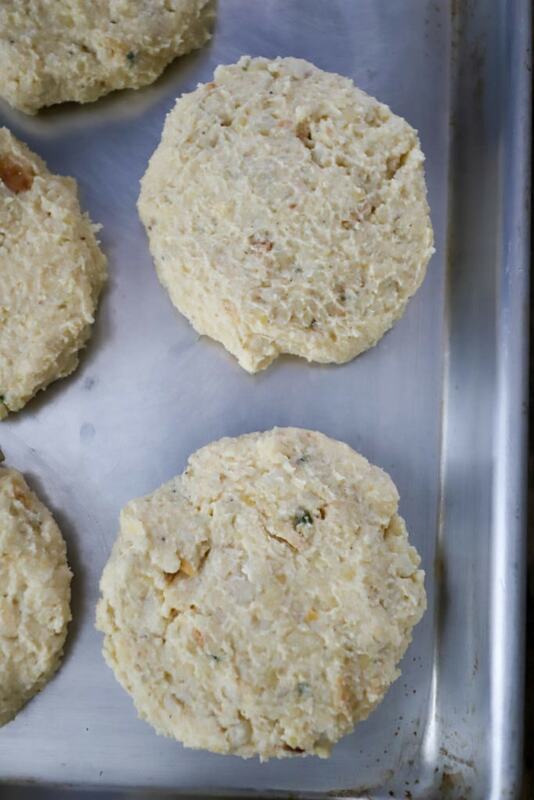 Form the mixture into patties, and place them on a baking sheet in the fridge for at least 15 minutes to firm up. This is messy, but work quickly and lightly with your hands – the patties don’t have to be perfect. 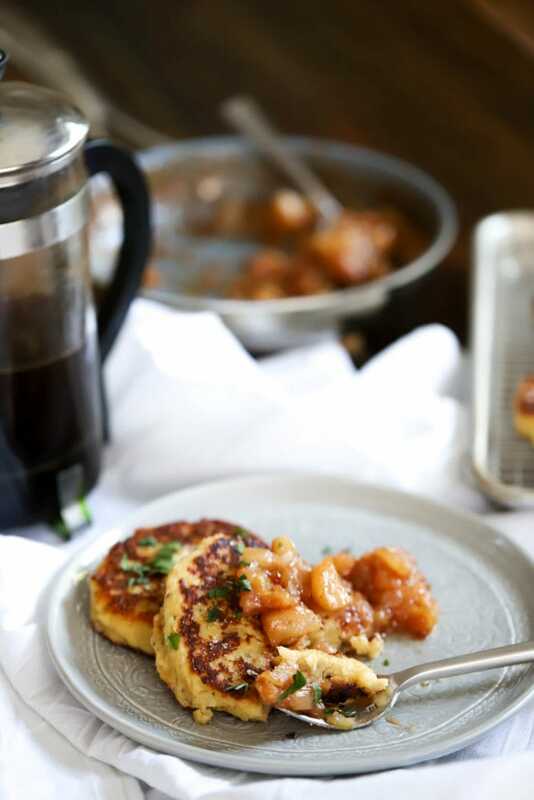 When the potato cakes have chilled, preheat a skillet with enough oil to coat the bottom of the pan to medium-high heat. When the oil is hot but not smoking, add the potato cakes gently to the skillet. Fry them for about 4 minutes on each side until they’re nice and brown. Be careful when you flip them – if your mashed potatoes were on the thin side the cakes might be fragile. 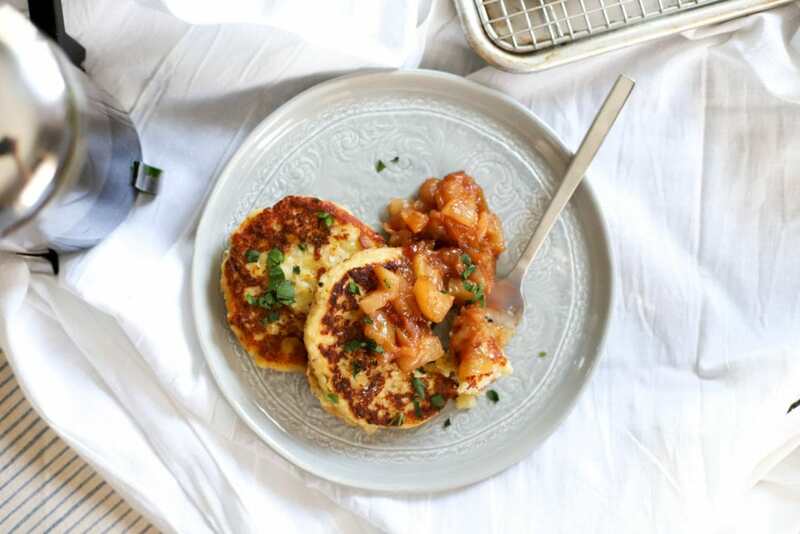 When the mashed potato cakes are crispy and the apples are done, serve! 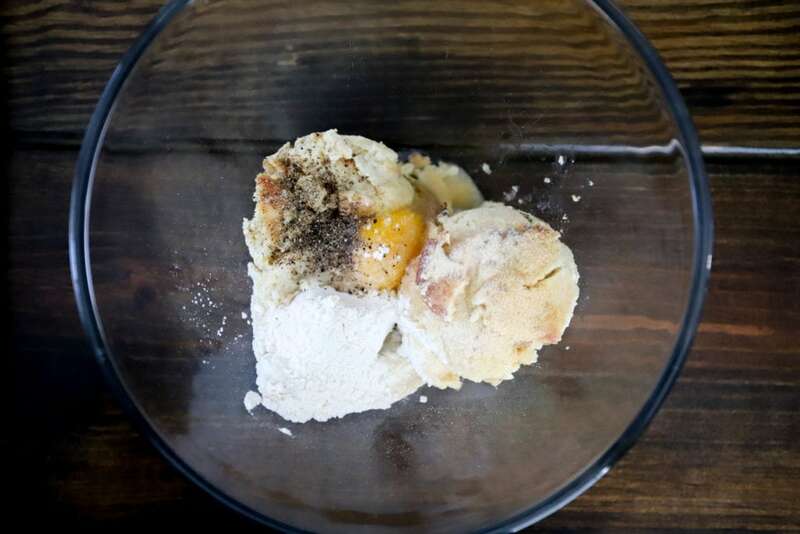 The savory potatoes with sweet apples is one of my favorite combinations, and this is a great place to set out any fruit or random bread/pastries you have from the holiday and call it breakfast. Extra coffee, maybe a mimosa or two, you know. A big holiday breakfast that uses up leftovers in a delicious way and gives you fuel for decorating, if you’re a Thanksgiving-weekend decorator: done and done. A perfect sweet+savory use for leftover mashed potatoes. 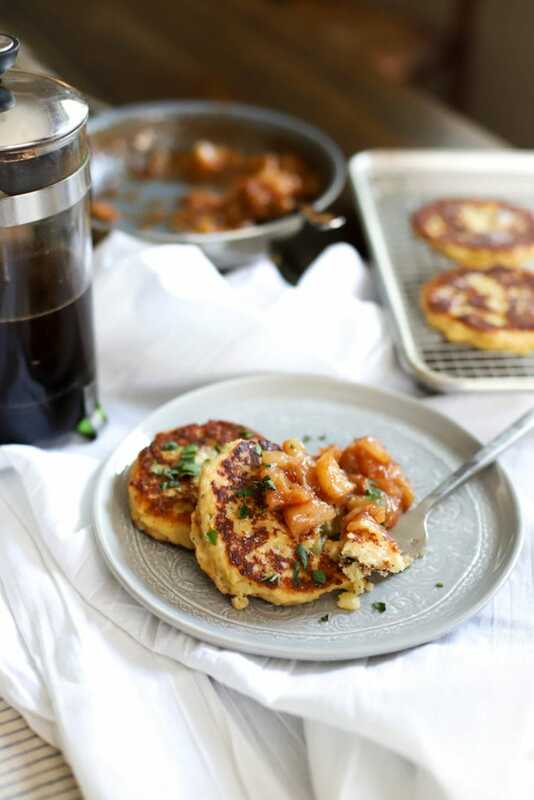 These cakes fry quickly and the apple syrup is done by the time the potatoes are! Start the apple syrup. Place the apples, butter, cinnamon, and sugar in a skillet over medium-high heat. Whisk together the water and cornstarch and pour the mixture into the skillet. Stir to combine, and let the mixture come to a bubble. 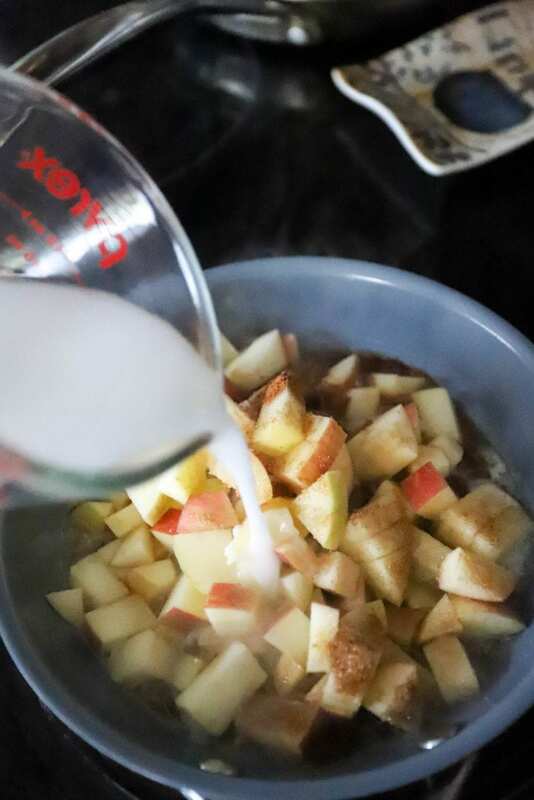 Cook the apples, stirring occasionally, for 30-40 minutes until soft and syrupy. If the liquid reduces too much, add more water 1/4 cup at a time during the cooking process to keep some sauce around the apples. Make the potato cakes. Combine all ingredients in a bowl and gently form into patties with your hands - about 6 patties. 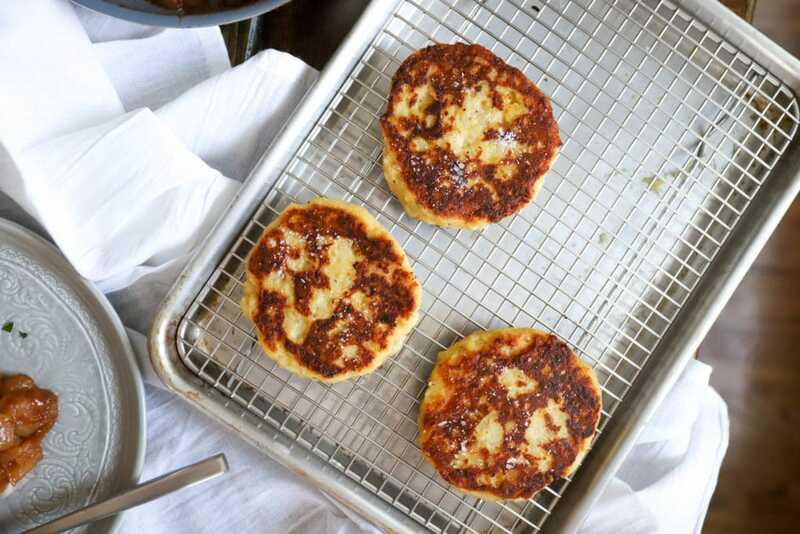 Place the potato cakes on a baking sheet in the fridge for at least 15 minutes to firm up. Before cooking, preheat a large skillet to medium-high with enough olive or canola oil to coat the bottom of the skillet. 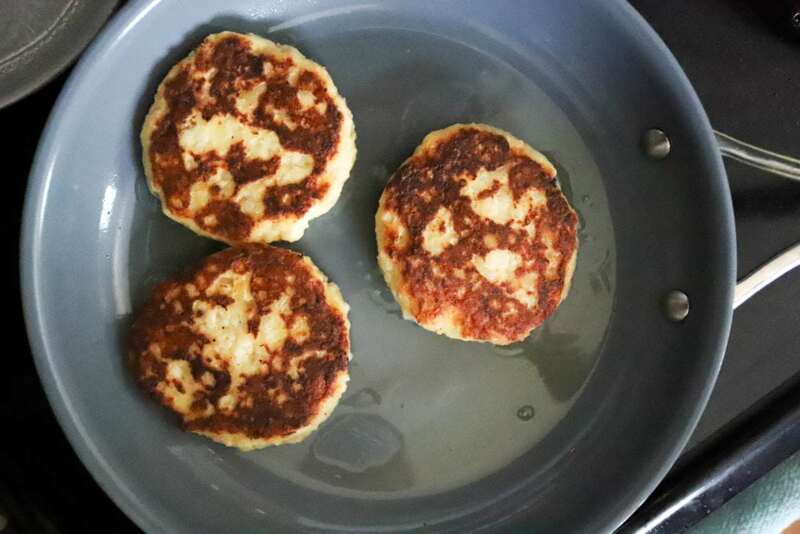 When the oil is hot but not smoking, add the potato cakes, working in batches if you need. Fry the potatoes for about 4 minutes on each side until golden brown and crispy. Flip them carefully with a large spatula so they don't break. 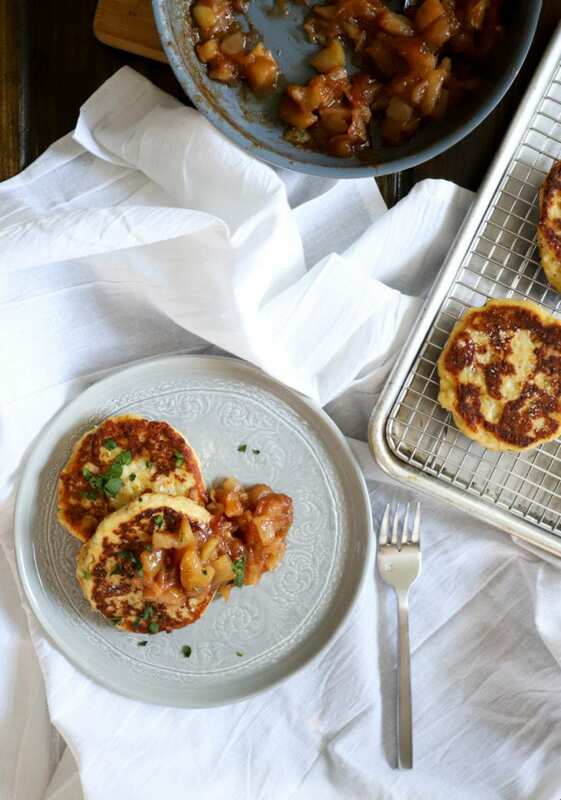 Serve the crispy potato cakes with the apple syrup. Enjoy! 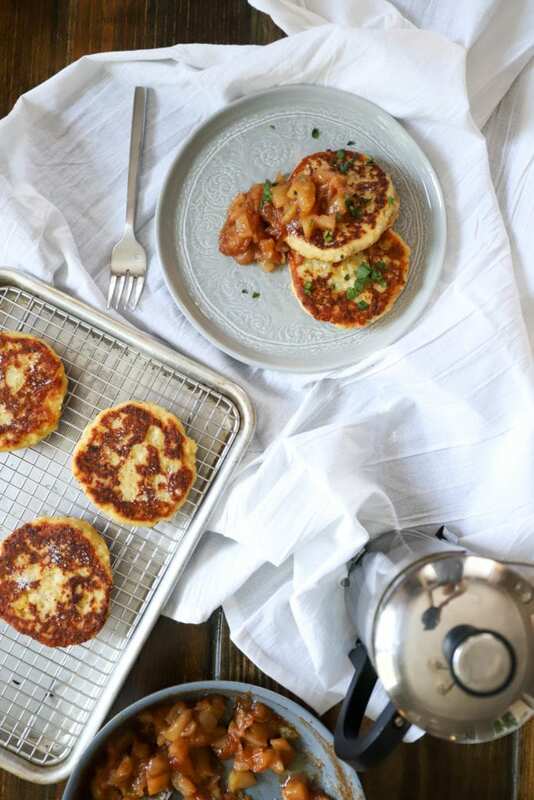 These potato cakes can be made in advance and kept in the fridge overnight, then fried right before eating.